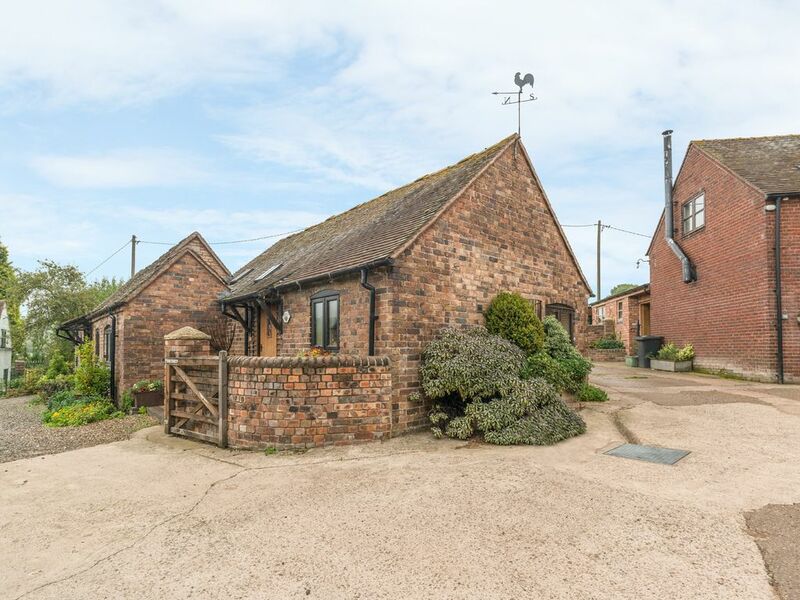 The Byre is one of four brick built barn conversions in a farmyard location on a 100 acre working cattle farm on the outskirts of the Shropshire village of Leighton near to Ironbridge. Boasting one double bedroom with a shower room, this cottage can sleep two people. Elsewhere in the cottage is an open plan living area with a fitted kitchen, sitting room with an electric log effect stove and a dining area. To the exterior of the cottage is off road parking for 2 cars and a front sitting area with outdoor furniture and countryside views. Just four miles from the World Heritage Site of Ironbridge, The Byre is a wonderful holiday cottage for anyone wishing to explore this part of the country. Amenities: Wall mounted (instant heat) electric convector heaters with electric stove in sitting area. Electric oven and hob, microwave, fridge, washing machine. TV with Freeview, DVD, WiFi. Electricity inc. in rent. Bed linen and towels inc. in rent. Off road parking for 1 car. Bike storage. Front walled garden with sitting area, furniture and countryside views. Sorry, no smoking and no pets. Shop 3 miles. Pub 3.5 miles drive or 20 mins walk by footpath. Note: Babes-in-arms only. Town: The village of Leighton, which is mentioned in the Domesday Book of 1087, stands in the heart of Shropshire, and is only four miles from the World Heritage Site of Ironbridge, home of the world's first iron-built bridge, built 1777-79. The Ironbridge Gorge is one of the country's most delightful tourist attractions; situated in a lovely wooded valley, the village has many pubs, restaurants, shops and tea rooms. A collection of industrial and Victorian themed museums make up the Ironbridge Museums, including the renowned Blist Hill Victorian Village, where you can step back in time. Enjoy the nearby medieval towns of Much Wenlock, Shrewsbury and Ludlow, as well as many NT properties including Attingham Hall and Park as well as the fascinating Wroxeter Roman City and Vineyard. All ground floor. One double bedroom. Shower room with shower, basin and WC. Open plan living area with fitted kitchen, dining area and sitting area with log-effect electric stove. Wall mounted (instant heat) electric convector heaters with electric stove in sitting area. Electric oven and hob, microwave, fridge, washing machine. TV with Freeview, DVD, WiFi. Electricity inc. in rent. Bed linen and towels inc. in rent. Off road parking for 1 car. Bike storage. Front walled garden with sitting area, furniture and countryside views. Sorry, no smoking and no pets. Shop 3 miles. Pub 3.5 miles drive or 20 mins walk by footpath. Note: Babes-in-arms only.